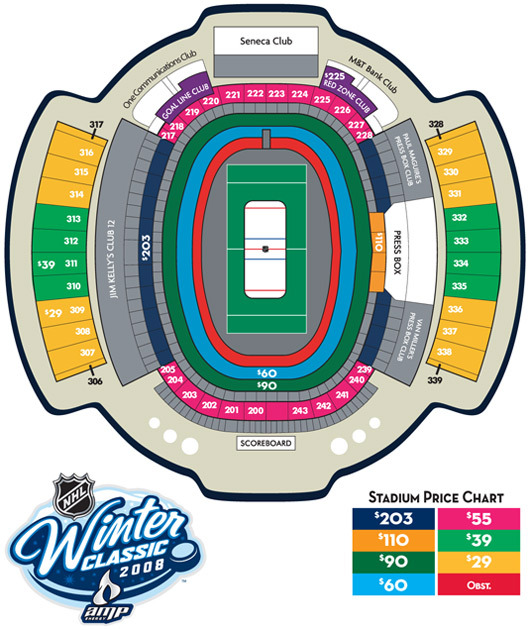 Tickets for the 2008 Winter Classic are now soldout. Approximately 41,000 seats were sold in less than 30 minutes. The remaining seats are being held for Sabres Season Ticket Holders, Bills Club seat holders and the NHL, as well as Buffalo and Pittsburgh players. Nearly 7,000 seats at the lowest possible levels are obstructed due to television cameras for NBC's broadcast. The Buffalo Sabres and Pittsburgh Penguins will make National Hockey League history on New Year’s Day, 2008, when they play in the AMP NHL Winter Classic, the League’s first regular-season outdoor game in the United States.